This document covers Commissions payouts, both via PayPal as well as manually via other systems. Both methods make use of the Mass Payment File format. Notice for Stripe Payment Gateway Users: Stripe Connect is currently not supported as a method of paying out commissions. From your Commissions page at Downloads → Commissions, there is a button in the top left that says Generate Mass Payment File. Clicking this option will open a small form allowing you to select a date range as well as a minimum value owed to the vendors. For example, it may not be worth to pay out less than $1.00 to vendors. The Minimum field accepts only integers. Once you click Generate File you'll be asked to download a .csv file containing the PayPal emails and amounts for all commissions. If you're paying with PayPal, simply log into your PayPal account, click " Send Money", and then select "Make a Mass Payment". NOTE: MassPay is an older feature of PayPal, and is not enabled by default. If you don't currently have this option you can request that it be enabled from PayPal. 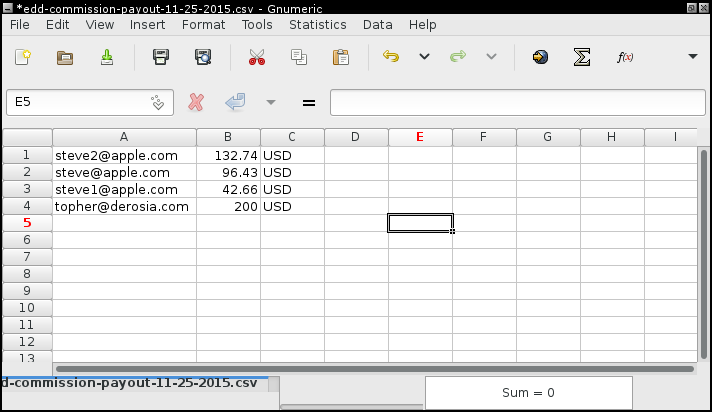 From this screen, upload the .csv file downloaded from WordPress, review and submit. Once you have downloaded a payment file, all unpaid commissions will be marked as paid. The payment file will only include unpaid commissions. After commissions have been marked as paid, the " Commissions per month" graph on the Reports page will be updated to reflect the total amount paid out. If you would like to payout Commissions instantly (at the time of purchase), you can use the PayPal Adaptive Payments gateway along with the Instant Pay option in Downloads → Settings → Extensions. NOTE: You may use Manual Payouts with PayPal also if you don't wish to or cannot use the automated system. See blow for instructions. By default, the Commissions add-on will use the email associated with a user's WordPress account as their PayPal email. If you need to change the email that is used to pay a user (because their account address is different than their payment address), simply go to that user's profile in the WordPress admin, scroll to the bottom and enter their email in the field titled "User's PayPal Email". Once you understand how to make manual payments you'll need to open the Mass Payment File csv file in a spreadsheet application. As in the screenshot above you'll see a list of people and the amount owed to each person. Simply make manual payments to each one of them for the amount listed in the CSV.